Assessing the CMS cost options? The risks and costs associated with CMSs can be frightening. Many organizations have entered a CMS project, and are still to come out. Frustrated by the on-going costs of getting the CMS to work and then the costs of keeping it working. Partly this is due to unrealistic expectations but the primary reason is not looking at all the costs upfront and assessing the resources available to support a complex IT initiative. A basic for assessing your immediate and ongoing costs for any application is where the application a lives and how will it be supported. If you have limited IT resources then you need to be careful where you use them. Ideally, the CMS should be a tool to facilitate you doing business and allow your resources to do what they do best. There are various flavors of Open Source. Check the features in the Open Source release and the level of support available. Open source companies have a commercial model which you should understand. Community release vs enterprise release: the Community release has had limited testing, no support from the vendor or partners, and can have limited features. Essentially it is good for proof of concept before purchasing the enterprise release, small companies that cannot afford the enterprise release, or for non-business critical applications. The Enterprise release usually has a (not insignificant) annual cost for maintenance/support which is usually the same model as above for the Traditional On-Premise products. With Open Source it is not for the faint hearted. There are significant additional costs: cost of hosting the server yourself, hiring IT/devops or custom developers, maintaining it between releases, etc. For either enterprise or community, that’s very non-trivial. A SaaS type model can be very appealing to a business in that it allows resources to concentrate on their business. 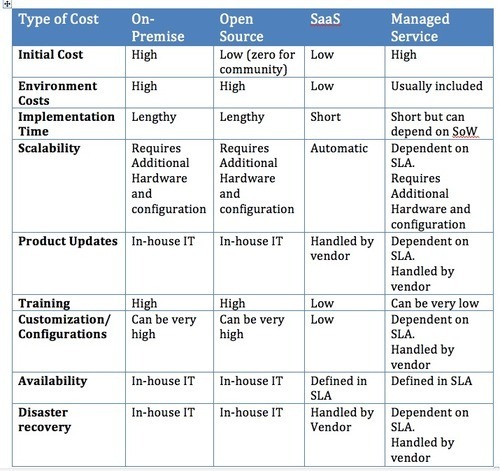 This may appear like SaaS but there are be variations on where the software is installed (vendor/on-premise/cloud/SaaS) and levels of responsibility defined in the Service Level Agreement. Additional Services may be included to handle customizations which can include broader IT and support needs . Cloud CMS is a cloud content management system that makes it easy for any business to create, manage and publish amazing content to their web sites and mobile applications. Whether you wish to deliver content to a single application or desire a platform for empowering a unified content strategy across all of your apps, Cloud CMS provides the suite of tools needed to achieve your vision. We provide the cloud backend to let your business integrate easily with iOS, Android, the web and other types of devices. From digital agencies to small business and the enterprise, Cloud CMS users keep their customers up to date with real time publishing and analytics.